Welcome to Taylor Canyon Paradise! Welcome to the Alpine Condo! Welcome to Taylor Canyon Paradise outside beautiful Almont, Colorado! This incredible home is situated on 1.6 acres of land with plenty of mature trees for a secluded feeling. Take advantage of the many decks and abundance of outdoor seating. Enjoy access and fishing rights to approximately 100′ of beautiful Spring Creek. 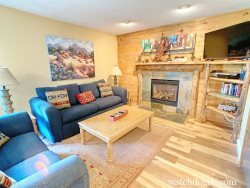 The Taylor Canyon Paradise is a 3 bedroom and 3 bathroom cabin that has been recently remodeled with several modern luxuries. The open floor plan features a top-of-the-line kitchen with custom cabinetry, granite counters, and stainless appliances, while maintaining its rustic charm with original hardwood floors and unique furnishings. Use the over-sized peninsula for dining or socializing with the chef. The sky light in the kitchen allows in extra natural light creating a very pleasant atmosphere! Each bedroom has an attached, full bathroom. The master bedroom has a king bed and a steam shower in the attached bath. It also has private exterior access to a covered deck with seating. The second bedroom also features a king bed and the final bedroom has two full beds. This is an ideal location for the fisherman, off-road enthusiasts (ATV/motorcycle/snowmobile), hiker, biker, or person who just wants to relax and enjoy Mother Nature. Enjoy a cozy fire inside or sit on the deck and enjoy the stars. Bringing a trailer full of toys? The large U-shaped driveway allows for easy access, no backing required! Wildflowers are in gorgeous bloom during the summer and the aspens’ amazing color transition occurs in the fall. The cabin is visited with wildlife including humming birds, eagles, otters, fox, deer, elk, badgers, big horn sheep, moose, and bear. The property features access to 100 ft of river front on Spring Creek to fish for brook trout. Head down to the Taylor River to catch your trophy fish and just 15 minutes away are both the Taylor and Spring Creek reservoir. You can also visit Blue Mesa reservoir which is approximately an hour away. The towns of Crested Butte (known for world-class skiing and mountain biking) and the town of Gunnison are approximately 25 minutes away. This beautiful hideaway is one that your friends and family will want to come back to year after year! Enjoy the updated conveniences of this beautiful property and the incredible natural nature-abundant setting. Best of all worlds! Call 970.349.7446 to book today! Please inquire with our office for any winter dates as winter reservations are accepted on a case by case basis. The garage and the space directly above the garage will be locked for owner storage and will not be available for guest use. This property has Hulu Live and Netflix. It DOES NOT have cable (Dish, Directv). RV's and camper trailers are not allowed at this property. During winter reservations this property may require 4 wheel drive. Please plan accordingly, if you would like ensure your vehicle will be able to make it to the property before booking, feel free to call our office.